We have reached the state quarterfinals in the 11-Man classes of Kansas high school football, and the 8-Man classes will play the semifinals this week. Kpreps will continue to post state rankings throughout the playoffs culminating in our final poll after the state champions are crowned. Let’s take a look at the Kpreps.com rankings for November 11th. Check out our complete Rankings for further details. Class 6A is one of only two classifications where the top five poll did not change this week. Shawnee Mission East remains on top of the rankings after beating Lawrence 35-7, while Olathe North is ranked second after a 68-20 win over Shawnee Mission North. Blue Valley is ranked third and will travel to No. 2 Olathe North this week. Derby remains in the No. 4 spot after beating Wichita East, while Lawrence Free State beat Wichita Northwest 27-16 to remain at No. 5. The only change in the Class 5A poll occurred at the bottom as Wichita Heights re-enters the poll at No. 5 after knocking off last week’s No. 5 Salina Central, 10-7. The remaining top four teams advanced to the 5A quarterfinals. Top-ranked Bishop Carroll rolled past Goddard 67-0, while No. 2 Salina South slipped by Kapaun Mt. Carmel 19-14. Pittsburg got 300 yards and six touchdowns from Alex Barnes in a 42-21 win at Mill Valley, while No. 4 St. Thomas Aquinas struggled past Bonner Springs 23-15. Perhaps the upset of the week saw Mulvane score with 29 seconds left to top Class 4A, Division I’s No. 4 McPherson, 28-25. The Bullpups were playing without quarterback Kyler Kinnamon for a second straight game. McPherson falls out of this week’s poll and is replaced by Fort Scott at No. 5. Defending-champion Buhler moves up a spot to No. 4 after winning at Ulysses. Bishop Miege remains No.1 after a 63-0 shutout of Basehor-Linwood, while No. 2 Topeka Hayden beat Coffeyville 40-16. KC Piper posted a third shutout on the season by beating Spring Hill, 33-0. Class 4A, Division II is the other classification where no changes occurred in the top five this week. Andale remains at No.1 after a 49-18 win over Smoky Valley, while No. 2 Holton blasted Osawatomie 54-8. Frontenac raced out to a 48-0 lead in the first half in routing Burlington, while No. 4 Columbus won at Girard for a second time this season. Holcomb remains ranked fifth after beating Colby 35-6. Class 3A teams played two rounds of playoffs last week. Top-ranked Rossville posted wins over Pleasant Ridge and Centralia, while No. 2 Scott City routed Ellsworth and previously-unbeaten Norton. Silver Lake is ranked third after defeating Maur Hill-Mount Academy and Sabetha. Perhaps no team had a more impressive week than No. 4 Wichita Collegiate. The Spartans beat Conway Springs 56-34 on Tuesday night, before outscoring then No. 5 Hesston 61-35 on Saturday. Hesston falls out of the poll and is replaced by St. Mary’s Colgan at No. 5 this week. The Panthers held Jayhawk-Linn to negative six yards of total offense on Tuesday night, then won at Galena 35-18 on Saturday. There is a change at the top in Class 2-1A this week. La Crosse moves back in to the top spot after routing Meade 34-0, while Phillipsburg falls to No. 2 after needing double overtime to advance past Sacred Heart 22-15. The remaining three spots remain the same this week as No. 3 Olpe, No. 4 Lyndon, and No. 5 Troy all posted impressive playoff wins. We are down to the state semifinals in both of the 8-man divisions. In Division I, top-ranked Hanover posted impressive wins over Madison and then No. 5 Udall. The Wildcats will host No. 3 Osborne in one semifinal this week. The Bulldogs eliminated Peabody-Burns and Marais des Cygnes Valley this week. Central Plains moves up to No. 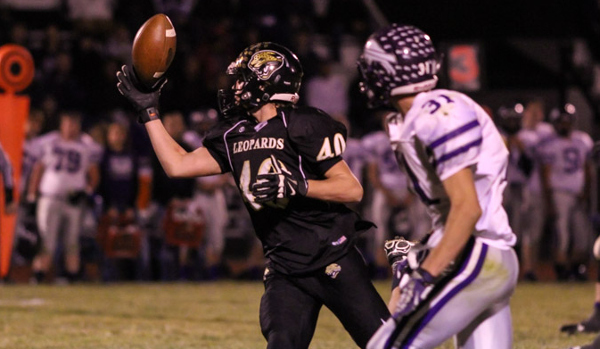 2 this week after edging previous No.2 Spearville 42-40 in an 8-Man classic. The Oilers advance to take on No. 5 Ness City in the west semifinal. Ness City enters the poll after defeating Oberlin-Decatur Community and Little River this week. Spearville drops two spots to No. 4 this week after their two-point loss at Central Plains. All five spots have changed in the Eight-Man, Division II poll. Victoria is the new No.1 this week as the Knights battled to a 34-20 opening-round win over Hoxie, then blew past Minneola 64-12 on Saturday. Victoria will take on No. 2 Sharon Springs-Wallace County in the semifinals. The Wildcats move up one spot this week after shutting out last week’s No. 5 Beloit St. John’s-Tipton and beating Ingalls 52-6. Argonia-Attica moves up one spot to No. 3 this week after scoring 140 points in two playoff wins over Southern Coffey County and Pike Valley. The Titans will get a big test this week as No. 4 Axtell comes to town. The Eagles enter the poll after a 78-28 win over Sylvan-Lucas Unified on Tuesday and a 42-34 win over top-ranked Chetopa on Saturday. Chetopa drops from No.1 to No. 5 this week after their 42-34 loss at Axtell. The Green Hornets played without all-state running back/linebacker Derrick Cassell who was injured late in Tuesday’s win over Caldwell.